How Cpl. Wm S. Cole might have looked. William stood 5’7″ and had blue eyes & brown hair. This letter was written by Cpl. 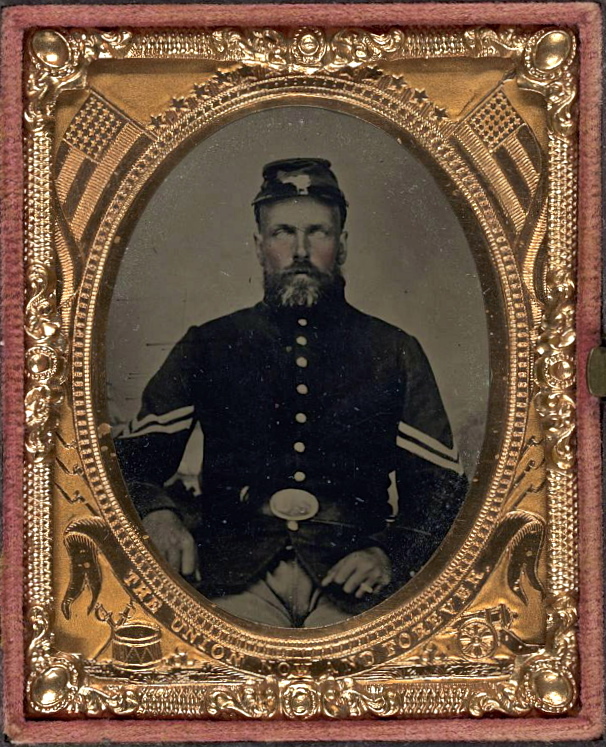 William Seward Cole (1835-1864) of the 151st New York Infantry who enlisted on 1 September 1862 at Barre, to serve three years. He was mustered into Co. D as a corporal on 22 October 1862 and promoted to a sergeant though no date is given for his promotion. 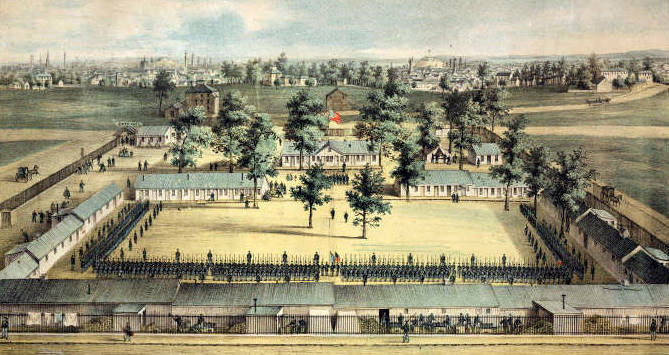 The 151st New York guarded the city of Baltimore until April 1863 and then participated in the battles at South Mountain, Gettysburg, Mine Run, Wilderness, Spotsylania, Cold Harbor, and Petersburg. Sgt. Cole did not return from the war, however. He was killed in action on 1 June 1864 † in the bloody battle of Cold Harbor in Virginia. William was the son of William Cole, Jr. (1797-1871) and Asenath Williams (1804-1883) of Orleans County, New York. William married Mary Louise Hill (1833-1919) not long before enlisting in the army. In this letter, Cpl. Cole writes from the outskirts of the city of Baltimore in barracks that were constructed in what used to be Lafayette Park [or Square]. He had just returned from guard duty at one of the numerous hospitals in the city. Cpl. 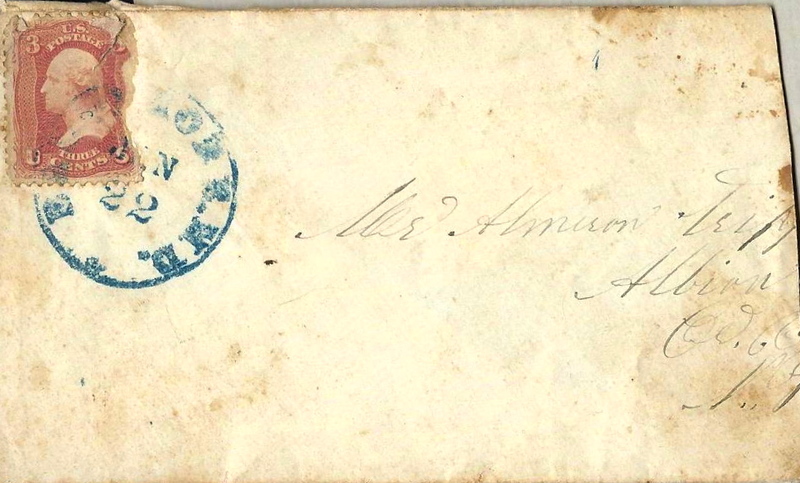 Cole wrote the letter to his acquaintance, Almeron Tripp (1815-1895), a farmer in Barre, Orleans County, New York. Almeron was married to Sylvia Burns (1813-1887). An 1855 publication mentions that Almeron Tripp was a grower of quinces. I am seated in my camp once more. We have been away guarding in the city but have thought of you & the rest of my friends around you. I am well & hope these few lines will find you all the same. I hope you will forgive me for not writing to you before. I have been very busy since I have been here. & have had good many to write to since I have been here. Mr. Tripp, I am a soldier in Baltimore, Maryland. I have been here long enough to find out what soldiering is. No wonder our men don’t do better. It’s because there is too much red tape ____ & too much money at stake & all want office. There is Capt. H. ¹ played up dog & ran home with his head down. The Col. ² & Capt. H. had a blow up before I came here & after I came here. We are all in good health & in good spirits but the officers are in a quarrel among themselves. I fear Capt. has resigned & gone home. We have no Capt. in our company. The 129th, 150th, 151st Regiments is all there is here now in Baltimore. Probably we will stay here to guard the city. Give my love to all and write soon and tell all the news. † One record says Cole’s date of death was 3 June 1864. The 151st New York led the advance of the VI Corps on 1 June and drove the rebels back near sundown. They engaged the enemy again on 3 June, pushing them back nearly a half mile under heavy fire, sustaining greater casualties than on 1 June. ¹ Capt. George S. Hutchinson —Age, 35 years. Enrolled, at Lockport, to serve three years, and mustered in as captain, Co. D, September 9,1862; discharged, December 12, 1862. Commissioned captain, November 10, 1862, with rank from September 9, 1862, original. ² The colonel of the Regiment was William Emerson. He enrolled at Lockport, to serve three- years, and mustered in as colonel, October 22, 1862; discharged, December 21, 1864.